The game really does strive to retain that comic book feel. Helping to add to the atmosphere of Spider-Man is the Gex-esque commentary of Peter Parker (and others) as the game progresses. For example, you may be jumping off of a roof to pursue a bank robber. 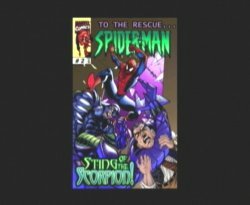 In this instance Spidey will say, "Mind if I drop in?" In another situation in which he is whipping up on some unsuspecting evildoers he will demote them even further with something along the lines of, "See ya, wouldn't wanna be ya." He also has different dialogue for various situations on each level. While the voice acting for Peter Parker and Venom are excellent, the others are just decent. Sound effects and music are standard fare, nothing too special. Spider-Man is also crammed full of unlockable extras. After finishing the game you are awarded with various costumes depending on the difficulty and various other factors. These "costumes" are actually different skins for your character and can affect the game itself. These include: Quick change Spiderman, Spidey Unlimited costume, Peter Parker himself, and many more. Not only do they look really cool, but each suit also has its own special ability. Other unlockable features include a comic collection, storyboards, game covers, and more! The Spider Radar tells you where you are, while the Spider Shadow is just a big circle. 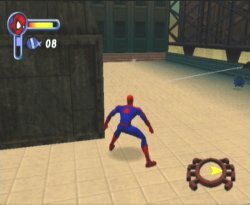 Spider-Man's graphics, while impressive, are definitely not anywhere near Dreamcast quality. You can tell the game was not developed for this console. Imagine what Neversoft could do if they made a Spider-Man title specifically for the Dreamcast hardware? As I mentioned in the opening paragraph, the game sports some pretty ugly CG. (I use this term loosely, because I'm not even sure it deserves to be called that. It actually looks worse than the game engine itself.) In addition, this title has some serious sound problems. At times, the music will just cut out for no reason, and you will be in silence. Occasionally, the sound effects will sound as if they are "skipping." I believe this has to do with the music/sound effects clashing. The music, while not bad, tends to get repetitive, and there just isn't enough variety. Neversoft has a knack at creating fun to play, addictive games, and Spider-Man is definitely not an exception. Not only have they done the license justice, but they also have managed to maintain the feel and atmosphere of a Marvel comic while still bringing a well-crafted, unique 3-D platformer to the market. If I wore a hat it would be off to you guys. Now lets see that sequel! Highs: Awesome comic atmosphere, solid graphics, addictive storyline and gameplay, great combo/fighting system. Lows: Graphics not up to DC potential, Sub-par Sound/Music, Ugly CG cinemas.